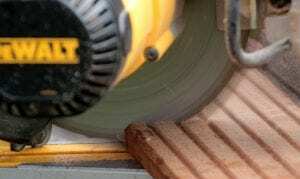 A miter saw is a tool that cuts miters, or angled cuts. 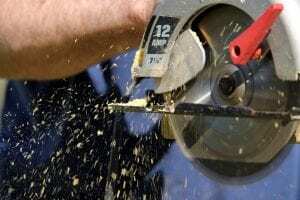 As one of the most popular, most versatile tools in any handyman’s workshop, a miter saw, also called a chop saw, is an indispensable and handy tool that has the capability to make almost any kind of cut imaginable, and once you learn all the magic behind what this powerful miter saw can do, well let’s face it: This will transform your life forever. When in the market for the best miter saw tool, there are several different types from which to choose. 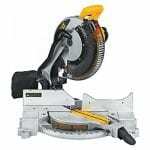 View the Best Miter Saw on the Market, Below. What Does A Miter Saw Do? Which Compound Miter Saw Is The Best? Which Miter Saw is the Best For Homeowners? Which Sliding Miter Saw Is Best For DIY? What Size Miter Saw do I Need? The basic miter saw that bevels in one direction, the compound miter saw, which features blades that pivot left and right and tilt for bevelling; the dual compound miter saw, which also adds the ability to tilt the blade in two directions; and the sliding compound tool, which is all the above but allows more application extension by moving the material or the cutting blade forward and back. Let’s take a closer look at our review of the top miter sawing tools. Designed to deliver quick, precise 45-degree bevel cuts through dimensional lumber with 11 positive stops and an adjustable stainless steel detent plate, this saw delivers repeated accuracy and durability on the worksite. There is a tall sliding fence that supports crown molding up to 5 1/4-inch nested and base molding up to 6 1/2-inch vertically against the fence, while easily sliding out for bevelled cuts. At only 42 pounds, this is a lightweight model with a built-in carrying handle for easy portability. This saw comes with a DeWalt warranty package that includes a three-year limited warranty and one-year free service contract, plus a 90-day money-back guarantee. See more information on DEWALT DW715. This is a well-built saw that comes out of the box ready to go. This is one of the best to operate and produces very accurate, beautiful cuts. Perfect for custom work, the DeWalt DW715 has a great angle adjustment and runs clean and smooth. We love the portability that allows us to move this tool wherever needed, and the vacuum attachment makes cleanup so much easier. This 12-inch dual-bevel glide miter saw features a powerful 15-amp motor that delivers a smooth, accurate cutting performance with a space-saving design that is exclusive to the Bosch Axial-Glide System. The square lock fences are pre-aligned to maintain a lifelong accurate cutting. This tool sports a soft-grip handle along with a combination dust chute and vacuum adaptor for best user comfort and a clean operation. The no-loads speed of this durable saw delivers quick cuts in many different materials, and this tool is compatible with a variety of 12-inch blades with a clear lower guard to provide clear, cut-line visibility. See more information on Bosch GCM12SD. The Bosch GCM12SD is sure to impress not only with its clean, precise cuts, but with the powerful motor and the quickness of cutting through material like a breeze. The controls are intuitive to use, and having them up front makes them so much more convenient. The built-in extensions are great to have, along with the dust control that keeps the work area relatively clean. If you need the best in smooth, precision cuts and crosscuts with a variety of materials including wood, panels, soft fiberboard, hard board, plywood, and aluminum sashes, look no further - this tool does it all. Powerful and reliable, this saw includes positive angle stops to let you select preset points at specific angles and has a 45 degree bevel for more precise cuts. This saw also includes a dust collector to help keep the interior components clean, and a nice, comfortable elastomer grip that is made to reduce vibration and help maintain control at all times. Hitachi stands behind this miter saw with a five-year professional warranty. See more information on Hitachi C10FCG. We like the fact that this tool isn’t too complicated - it provides the best amount of what you need and want in a miter saw. Ready to go out of the box, it is a solid, powerful, and versatile tool that performs well on several materials with sturdy support. The included blade makes clean, sharp cuts, and isn’t too heavy - the soft grip makes it easy to carry around. This power-packed tool with a 15-amp motor and a no-load speed of 5,000 rpm delivers quick, accurate cuts and is ready to handle a wide range of applications out of the box. There’s an easy to adjust cam-lock handle, convenient miter and bevel stops, and a tall fence for handling oversized decorative moldings. This tool also comes with a sturdy carbide blade, a blade wrench, and a dust collector to keep everything clean and tidy. Weighing in at just 35 pounds with a convenient carry handle, you can easily lift and move it around as needed. See more information on DEWALT DW713. With a name like DeWalt, what isn’t there to love? This miter tool delivers a beautiful performance at a budget-friendly price. Easy to set up, this sturdy tool exceeds our expectations with accurate calibration and controls that are easy to operate. The instructions are clear and concise making this one of the best models for both novices and professionals alike. A perfect fit for everyday or DIY use, this tool features a powerful 14 amp motor that will cut right through wood like butter and spins at a highly impressive 5500 rpm and works well with virtually all miter stands. The red laser light provides ample visibility, making your precision cutting that much better. There are five miter stops with clear-cut degrees for locking in your angles and will make bevel cuts up to 47 degrees. At only 25 pounds, this miter saw is very portable without much trouble. See more information on Homecraft H26-260L. This impressive H26-260L tool provides a quality machine for an affordable price. The assembly was straightforward with easy instructions, and done within a few minutes. We love how crystal-clear the red laser beam is for the best precision cutting, which is refreshing from the fainter beams on other models. The incredible 5500 rpm rotation is faster than other miter tools on the market, cutting through wood like it was nothing. Right out of the box, the Makita LS1018 starts delivering accurate, large cutting performance. Everything you have ever wanted in these tools, but in a lightweight, compact design. This versatile tool is powered by a 13-amp direct drive motor with soft start, which means a smoother startup. This corded model provides a consistent power that remains constant with no parts to replace and is ideal for finer woodworking, carpentry, and general construction. There are five miter stops with bevel cuts to 47 degrees, and a linear ball bearing system made for “dead on” accurate cuts, plus a convenient electric brake. See more information on Makita LS1018. This Makita slide compound miter saw cuts precisely and slides smoothly to handle any type of woodworking project. The 13 amp motor provides more than enough power to handle any application, and the blade that is included with this set cuts precisely and sharp. Easy to adjust and setup. Best recommended for the average woodworker and DIY’er for a variety of applications. This reliable and versatile tool provides straight, angle, bevel and compound cuts all in one compact machine. With 15 powerful amps and a highly impressive 5500 rpm, this machine is able to easily slice through anything that is put in front of it. The spacious work table will easily provide ample room for boards up to 11 inches in depth. A 60-tooth carbide-tipped blade is included for sharp, precise cutting and the handy dust collection bag helps minimize sawdust cleanup. Combine all this with a lightweight design and a generous 2-year warranty, and you have a miter tool that is hard to resist. See more information on WEN 70716. This tool cannot be beat in its versatility. Adaptable to many materials and multiple uses, and we found that it is also quieter than other models as it cuts. The large work table functions well for most projects, and the motor provides the best power to push through the more challenging work with no problem. There are a lot of nice features too long to list, all packed into an impressively lightweight design. DeWalt does it again with a powerful 15-amp motor that delivers durability and power to your cutting project. The tall sliding fences will support crown molding up to 5 1/2-inches nested and base molding up to 4 1/2 -inches vertically, and easily slides out of the way for bevel cuts. There is a stainless steel detent plate that adjusts to 13 positive stops to improve the cutting accuracy and performance. The miter system and base fence support provides optimal, durable precision in cutting. Includes a carbide blade. See more information on DEWALT DWS709. This saw has proven to be a real workhorse when it comes to precision and durability. Built well and packed with plenty of power to get the job done, it provides fast and accurate cuts. DeWalt engineers have thought of the finer features that make this miter saw one of the best on the market, including an oversized easy-to-read bevel scale, and providing protective pads on the stainless steel plates to lessen wear. Designed to make setting precise bevel and miter levels easy, this Milwaukee tool lives up to its brand with an angle fine adjust, and detent override which is a digital display that shows you the correct angle down to one-tenth of a degree. This feature eases the work for accurate repeat cuts, even with odd angles. The angle fine adjust has a self-zeroing system that works on the entire angle range. There are dual integral job-site lights that fully light up the work piece and cut line, and the 15-amp motor provides high-performance power. See more information on Milwaukee 6955-20. Milwaukee has always been a trusted brand with professional contractors, and this saw maintains that reputation with some amazing features and ease of use. As with many other miter tools, this one has a 15-amp motor, but what sets it apart is how it maintains a constant cutting speed under load, and it doesn’t bog down, providing the best clean, consistent cut. There are so many features we don’t have the room to list, but try it out yourself - you won’t be disappointed! Craftsman does the job well with many features, including a powerful 15-amp motor that delivers high torque and speed that goes up to 4800 rpm, ready to perform well and slice seamlessly through all densities of wood. This miter saw provides precise, smooth cutting with laser guided protection, and uses smaller blades that are easier to maintain, but still delivers the capacity to spin through boards up to 12-inches wide. The 0-50 degree miter adjustment includes common positive stops, and the blade guard protects it from accidental bumps during use. See more information on Craftsman 21237. In minutes, this miter saw is assembled and ready to use. It has a solid-sturdy build and the saw head moves consistently smooth along the rails. The rails themselves slide nice and smooth as well, and they have enough resistance that they remain sturdy. The laser adjusts well, and with a 4800 rpm this tool cuts fast and accurately well. One of the best additions to anyone’s workshop. A power miter saw, also known as a chop saw or drop saw, is a specialized saw designed to make cuts at many varieties of angles. Invented by Ed Niehaus in 1964 for Rockwell, the miter saw has a blade that is mounted on a pivoting swing arm that moves left or right to make angled cuts. This tool can be used as a fast saw to cut for crown molding, picture frames, door frames, casings, and more. Because Rockwell never patented the design, there have been many different innovations and new technologies applied to this miter saw by manufacturers that is still apparent today, including radial arc spring action, blade brakes, and dust collecting. The miter saw comes in several different variations, but essentially it makes cuts by pulling a spinning circular miter saw blade down onto material like wood or steel in a short, controlled motion. The material, or workpiece, is held down by a fence, which provides a cutting angle that is measured precisely between the plane of the blade and the plane of the longest edge of the workpiece. In a standard position, this angle is held at a 90 degree angle. The miter index is a feature that allows the angle of the blade to change relative to the fence. While there are precise one-degree increments to the index, many miter saws will also provide “stops” that quickly set the miter index to the most common angles. Standard miter saw – Cuts straight cross-cuts on lumber at a wide range of angles, commonly used to create 45 degree straight cuts for framing. Compound-miter saw – Compound miter saws have blades that will pivot left and right, and also tilt in a single direction for bevel cutting. Controlling the saw on both axes at the same time produces a compound cut. These miter saws are useful for picture frames, crown molding, or any other project that requires dual-plane angles. The advantage to compound miter saws is that they will produce two angle cuts in one pass. Dual compound-miter saw – These function like compound miter tools, but while those will only tilt in one direction, dual compound saw will tilt both left and right, and are able to create bevels at any angle quickly. Sliding compound miter saw – These have all the features of a compound saw, but similar to a radial arm saw this allows you to move the blade forwards and backwards. this provides the potential for cutting at an increased length. Laser LED sliding dual compound miter saw – This includes a disc-shaped washer which is a laser that attaches to the blade to show where the blade will cut, illuminating the area. Amps measure the power of the motor. Higher amps mean more cutting power. Blade size There are many different sizes of blades, each size is important to its functionality and material.The most common sizes for a miter saw are 8, 10 and 12 inches. The larger in diameter of a blade, the longer cut it will make. Positive stops are the preset points where you can quickly make cuts. Some saws have thumb-activated stops for quick adjusting. Depth stops are for controlling the height and how deeply the blade cuts into the work piece. Articulated blade guards help protect when the blade is in use. When you raise the saw, the guard lowers to completely cover the blade. Electric brakes stop the saw in seconds by reversing the flow of the saw’s electricity when you release the trigger. Reversing the current stops the blade’s momentum quickly. Spindle or shaft locks keep the shaft and blade from moving, making it much easier to change the blade. Dust chutes and blowers help remove saw dust from the cutting area. Dust bags collect sawdust, mounted directly to the saw. Table extensions support longer material to give an accurate cut, connected to the sides of the saw. Sliding and flip fences provide added support to taller material for standard miter cuts. Laser guides and guide lights shine a beam or cast a shadow onto the work piece that helps you accurately guide your cuts. Digital displays provide easy-to-read bevel and miter setting information. Compound miter saws offer two bevel options – single and dual, which makes it more flexible with angle varieties. The blades pivot left and right and also tilt in a single direction for bevel cutting. Controlling the saw on both axes at the same time produces a compound cut. These saws are useful for picture frames, crown molding, or any other project that requires dual-plane angles. The advantage to compound saws is that they will produce two angle cuts in one pass. This kind of saw is harder to operate, and a bit more expensive than a basic miter saw, but the end result is worth the extra effort and is ideal for those who use this miter saw often for making bevel cuts, and work well with pieces that are harder to maneuver. For the best compound saw, we suggest the DEWALT DW715 12″ Bevel Compound Miter Saw with a thin kerf blade that makes precision cuts easy as pie, and works great with finer woodworking projects like crown molding. The thinner cuts ensure that there is less wasted material and time. The beveling capability allows precise cutting of any type of angle, beveling up to 48 degrees, and has 11 positive stops at the common trim angles to ensure accuracy in measuring, without excess, and it does a great job at keeping up with all the different materials as well as the different sizes of wood. This compound saw meets the demands of whatever is set in front of it, delivering durability and precision over and over. For optimum operation safety, the saw guard covers the entire blade so it is not exposed. The miter detent override allows for customized adjustments beyond the stops, which prevents the miter from dropping into a preset detent, and makes cutting so much easier, eliminating any guesswork. Another compound miter saw we recommend is the Hitachi C10FCE2 10″ Single Bevel Compound Miter Saw for a name to trust in power saws, including miter saws, for innovation, technology, and top of it’s class warranties. The 10-inch blade spins faster than other larger miter saws, meaning a smoother cut at less capacity. This 15-amp saw delivers a 5000 rpm speed, which is ample power for your beveling and cross cutting. The bottom clamps make it so nice and easy to secure this miter saw to the work table for more cutting accuracy, as well as the handy clamps to secure your work pieces in place. There is an innovative laser alignment that makes cutting a breeze and super easy to accurately position your cuts, and the dust collector is an improvement over previous models when it comes to sufficiently trapping saw dust. Weighing in at under 27 pounds, the C10FCE2 is one of the lightest 10-inch saws on the market, making this miter saw easy to tote around your work area. Along with a powerful motor and a whopping five-year warranty, this saw is well worth the money and is a great value. Do you remember back in the old days when you were new to the world of sawing and sweated for hours using a hand saw for your projects? Even then, the end result left much to be desired. But today, thanks to a lot of amazing tutorials on the internet, it is now possible for the average Joe to learn how to work with power tools and perform just about any DIY project, saving months or even years of learning from the hard, old fashioned way of blood, sweat and tears. There are several kinds of power tools that can create angled cuts in material, however, miter saws are the greatest tools to use because they are made to be extremely precise in cutting angles. The blade of the miter saw is positioned in such a way that it allows for ultra-fine tuning the cut up to a fraction of a degree, so you will always get a perfect result. The arm of the miter saw is one of the defining features of the overall quality of this miter saw, so when choosing a saw, you should first keep this characteristic in mind. Also, you will need to be aware of the limitations of this saw – for all it offers for cutting angles in many directions, it isn’t perfect for handling other types of work, including for example, ripping lumber, which is best done with a table saw or band saw, and cutting wider stock is very difficult to do with a miter saw as well. If you are looking to cut through metal, please head over to our guide on metal cutting saws here. A Cross Cut is the most basic cut, when the saw blade drops down at exactly 90 degrees, so you’ll be left with a perfectly straight cut. A Miter Cut is one in which you’re cutting along an angle at the width of the wood, so the blade will still drop down vertically, but will cut through at an angle for beveling or joining two frames, for example. A bevel cut is made by tilting the blade at a specific angle. so instead of cutting along the width of your wood, you’ll be cutting diagonally against the thickness of it. A Compound Cut combines both the miter and bevel cut together, so you’ll be left with two different angled cuts. This cut is almost impossible to do without a compound saw. Basic miter saw – Cuts straight cross-cuts on lumber at a wide range of angles, commonly used to create 45 degree straight cuts for framing. Compound-miter saw – Compound saws have blades that will pivot left and right, and also tilt in a single direction for bevel cutting. Controlling the saw on both axes at the same time produces a compound cut. These saws are useful for picture frames, crown molding, or any other project that requires dual-plane angles. 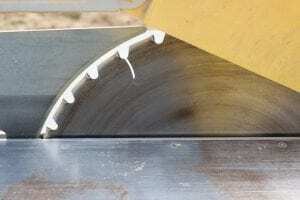 The advantage to compound saws is that they will produce two angle cuts in one pass. Dual compound-miter saw – These function like compound miter saws, but while those will only tilt in one direction, dual compound miter saws will tilt both left and right, and are able to create bevels at any angle quickly. Laser LED sliding dual compound miter-saw – This includes a disc-shaped washer which is a laser that attaches to the saw blade to show where the blade will cut, illuminating the area. This is just the basic run-down of miter saws. What is best for you is the one that will perform what you need, and we hope this will serve as a starting point as you research each type of saw to make an informed decision. There is one thing for sure: Whatever saw you choose, you will love how easily and accurately it will get a seemingly impossible job done, producing beautiful results. A sliding miter saw (click for our guide) offers all the advantages of crosscutting boards up to 12 inches wide, while still providing all the other benefits of a non-sliding miter saw. These are available with 7-1/2 to 12-inch blades, and can cost up to $1000, depending on what you buy and how it functions. Today’s sliding saws have impressive technology applied, including solid locking detent stops for spot on cuts, tilting controls for dialing in precise bevel setting snd motor carriages that smoothly glide back and forth. A powerful motor that is durable enough not to bog down. A tall fence to support angle crowns. Built-in table extensions to support longer boards. Angle markings that are easy to read. No-hassle angle adjustments and up-front controls. Based on our reviews, we have a couple of sliding saws we highly recommend for performance, accuracy, and value. Makita LS1018 10″ Dual-Bevel Slide Compound Miter Saw comes highly recommend. The Makita LS1018 delivers accurate performance when cutting large surface areas. It has pretty much everything you could want from a saw. It’s lightweight and compact. Powered by a 13amp direct drive motor, which includes a soft slow start, for a smooth start up delivery. Ideal for working with finer wood, this corded model provides a consistent power that remains constant with no parts to replace. For even finer woodworking, click here for our review on jigsaws, carpentry, and general construction. WEN 70716 10″ Sliding Compound Miter Saw – This reliable and versatile saw provides straight, angle, bevel and compound cuts all in one compact machine. With 15 powerful amps and a highly impressive 5500 rpm, this machine is able to easily slice through anything that is put in front of it. The spacious work table will easily provide ample room for boards up to 11 inches in depth. A 60-tooth carbide-tipped blade is included for sharp, precise cutting and the handy dust collection bag helps minimize sawdust cleanup. Combine all this with a lightweight design and a generous 2-year warranty, and you have a saw that is hard to resist. Spins faster. 12-inch blades tend to spin slower because of their larger radius. And more speed means smoother cuts, so a 10-inch blade that spins at 5000 rpm will create a smoother cut than a 12-inch blade that spins at 4000 rpm. For example the DeWalt DW713 is a power-packed miter saw with a 15-amp motor and a no-load speed of 5,000 rpm that delivers quick, accurate cuts. Easier to find on the market. 10-inch blades are more prevalent than 12-inch blades, so most likely your local hardware store will have these in ample supply. This is a great thing to know if you suddenly need to replace your blade and don’t have the time to shop around. More affordable. These are cheaper to buy than 12-inch blades, and the cost to sharpen a 10-inch blade is lower than sharpening the 12-inchers. In addition, a 12-inch blade will require more teeth to get the same quality cut as a 10-inch blade with the same structure. General Physics. Because of its larger size, a 12-inch blade will deflect or wobble easier than a 10-inch blade. Larger cutting capacity. Ten-inchers can be used to cut up to six inches of material; and for most woodworking projects, this will work just fine. However, if you tend to do a lot of larger projects frequently like decking, then having a 12-inch blade may be ideal for you. Versatile. Many 12-inch saws will allow you to mount 10-inch blades, which means you can have your cake and eat it too in terms of cutting versatility. Higher tooth speed. 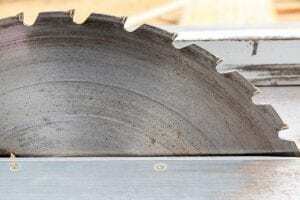 12-inch saws normally have a higher tooth speed, which will mean smoother cuts, which is especially helpful when doing fine woodworking – read this study for safety tips. Unless you are regularly working on larger, more specialized projects, and really have more of a need for a specific size miter saw, we would recommend going with the 10-inch miter saw for its overall performance with most DIY and professional cutting projects. 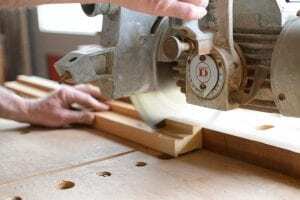 We hope this article has been helpful in your quest in finding the right size miter saw for your needs, so you can go forth in making that informed decision. With a thin kerf blade, precision cuts are as easy as pie with this miter saw, and works like a charm with finer woodworking projects like crown molding (click here to read the safety guide study). These thinner cuts ensures that there is less wasted material and time. Its beveling capability allows precise cutting of any type of angle, beveling up to 48 degrees, with 11 positive stops at the common trim angles to ensure accuracy without excess in measuring, saving time. This miter saw does a great job at keeping up with all the different materials as well as the different sizes of wood, and meets the demands of whatever is set in front of it, delivering durability and precision over and over. For optimum operation safety, the blade guard covers the entire blade so it is not exposed. The miter detent override allows for customized adjustments beyond the stops, which prevents the miter from dropping into a preset detent, and makes cutting so much easier, eliminating any guesswork. DeWalt Tools offers a three-year limited warranty along with a three-month money back guarantee, and also throws in a one-year service contract, making this miter saw well worth the investment. This miter saw has a patented Bosch Axial-Glide System that provides a smooth, durable precision with a compact workspace, and folds back, which allows it to save up to 12 inches of workspace. The GCM12SD also delivers a large cutting capacity with up to 16 inches horizontally and up to 6.5 inches vertically, giving you the flexibility to make a larger variety of cuts without worrying about space constraints. The pre-aligned square lock fences are aligned at 90-degrees right out of the box, help maintain the best cutting accuracy for the life of the product. And Bosch remembered the southpaws by offering an ambidextrous handle that anyone can comfortably use that works well with those strange angles by allowing the miter saw to turn either way. Ergonomically designed for a softer grip, this handle is easy to tote around as well. Tired of reading those reviews about the dust bag not working? Not here. Bosch has taken this feature to the next level by equipping the GCM12SD with a proper dust collection system with a 90-degree combo chute elbow, vacuum adaptor, and dust bag. With dust control, they got your back. As a compact workhorse, Bosch has done it all in this miter saw with a lot of clever, innovative features that makes this miter saw a premium choice. For innovation, technology, and best in class warranties, Hitachi is the name to trust in power tools, including miter saws. A compound saw is able to cut both miter and bevel angles at the same time, and a 10-inch blade spins faster than the larger miter saw blads, meaning a smoother cut at less capacity. This 15-amp tool delivers a 5000 rpm speed, which is ample power for your beveling and cross cutting. The bottom clamps make it so nice and easy to secure this miter saw to the work table for more cutting accuracy, as well as the handy clamps to secure your work pieces in place. The innovative laser alignment makes cutting great again and super easy to accurately position your cuts, and the dust collector is an improvement over previous models when it comes to sufficiently trapping sawdust. Weighing in at under 27 pounds, the C10FCE2 is one of the lightest 10-inch tools on the market, making this miter saw easy to tote around your work area. Along with a powerful motor and a whopping five-year warranty, this miter is well worth the money and is a great value. We hope you enjoyed our article on "The 10 Best Miter Saws for the Avid D.I.Y Homeowner & Trim Carpenter", if so, please share and rate it.